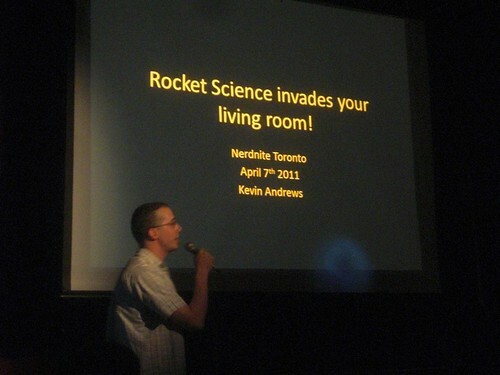 Last night I went to Nerd Nite IV: A New Venue, an event put on by the Toronto Nerd Nite group, organized by Virve Aljas. Nerd Nite: be there and be square. I had an awesome time, it actually reminded me a lot of Dorkbot back in San Francisco, a huge crowd of geeky people, drinking beer and cheering for science and technology. As is typical of these events, two of the three speakers were excellent - I totally enjoyed both the nano particles talk and the rocket science talk. The music talk I think would have been OK if it had been limited to 20 minutes, but instead he droned on for well over an hour... anyway, I still had a great time, and I also bought some of the great Nerd Nite buttons that they had for sale. Hurray for Refraction! Also in recent events: One of a Kind Show, Canada Blooms, Quantified Self Toronto #4, SproutUp Toronto, hacklab Pie day party. And tomorrow: Hacklab Robot Hackathon! I'll be leading our efforts to create a new robot overlord :-). So excited! I was the nanoparticle speaker. I'm so glad you enjoyed it! I had lots of fun giving it!